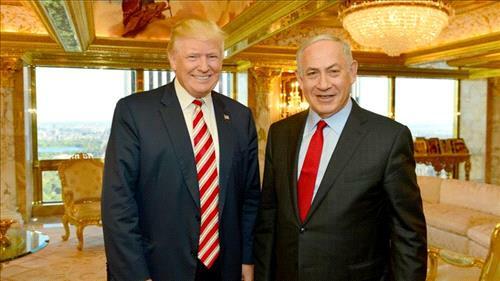 AMMONNEWS -By Neve Gordon - Congratulating President-elect Donald J Trump, Israeli Prime Minister Benjamin Netanyahu shared a YouTube clip on his Twitter account stating that he is "confident that the two of us working closely together will bring the great alliance between our two countries to even greater heights". Although Netanyahu did not specify the issues that he believes would strengthen the already close US-Israeli alliance in the clip, his right-wing choir was quick to explain. Minister of Education Naftali Bennett, the head of the Bayit Yehudi party, asserted that "the era of a Palestinian state is over." "Trump's victory," he clarified, "is an opportunity for Israel to immediately retract the notion of a Palestinian state … which would hurt our security and just cause. This is the position of the president-elect, as written in his platform, and it should be our policy, plain and simple." The possibility of an independent Palestinian state is, of course, inseparable from Israel's settlement project. Not surprisingly, therefore, Yossi Dagan, head of a Jewish regional council in the colonised West Bank, declared that the US elections mark a shift in this respect as well: "We have high expectations for a significant change in how the Israeli government treats Judea and Samaria following the election of a US president who is a friend to the settler movement in the West Bank. We expect an end to the construction freeze, and even more." As if to confirm Trump's support of the settlement enterprise, Jason Greenblatt, Trump's chief legal officer and executive vice president of the Trump Organization, who has been tapped as Trump's adviser on Israel, commented on Israel's Army Radio that, in the next four years, there "would be a stark departure from the long-time American stance that Israeli construction in areas captured in the 1967 Six-Day War makes it more difficult to reach a peace agreement with the Palestinians". Trump, in other words, is very unlikely to pressure Israel to slow down settlement construction on Palestinian land. Alongside settlements, Israeli politicians believe that Trump will help legitimise Israeli sovereignty over occupied East Jerusalem, including the swath of land that is most sacred to Muslims. Likud Member of Knesset Yehudah Glick rushed to invite Trump to "celebrate his victory on the Temple Mount", known to Muslims across the globe as Al-Haram Al-Sharif, or the Noble Sanctuary. Given that Trump does not appear to believe in the Armageddon, it is unlikely that he will revel in his victory at the world's third-most holy mosque. His extremely conservative and evangelical vice president, on the other hand, would have probably wanted him to do so. At the 2009 AIPAC convention, Mike Pence declared that "Israel's enemies are our enemies; Israel's cause is our cause. If this world knows nothing else, let it know this: America stands with Israel." One issue the next president and his vice president clearly agree upon, however, is the need to legalise Israeli rule in all of Jerusalem, and they intend to carry this out by moving the US embassy from Tel Aviv to Jerusalem. Netanyahu likely had Jerusalem in mind when he commented on the deepening US alliance with the Zionist state in his YouTube clip. Finally, a third issue that will further boost US-Israeli relations in Netanyahu's view is Trump's views on Iran. In an AIPAC meeting in March this year, Trump announced that his "number one priority is to dismantle the disastrous deal with Iran" and to "stand up to Iran's aggressive push to destabilise and dominate the region". While a few commentators have claimed that it is "unlikely" that Trump will disregard the nuclear deal with Iran, Netanyahu is set to pressure Trump to stand by his previous promises. It is, therefore, not surprising that in one of his first tweets after the elections, Netanyahu noted: "We are also concerned by Iran, which champions the destruction of Israel and also supports 360-degree terror on five continents." While everyone appears to agree that Trump "loves" Israel, some commentators say that he remains a mystery because he is utterly unpredictable. On my own WhatsApp account, acquaintances have compared him to former Prime Minister Menachem Begin, claiming that, like Begin, who surprised the world when he agreed to withdraw from Sinai in return for peace with Egypt, Trump may do the unexpected and pressure Israel to dismantle settlements and withdraw from the West Bank and East Jerusalem. This, however, is wishful thinking that's totally disconnected from reality. Two points need to be made in response to this line of reasoning, which seems quite prevalent among certain liberals in Israel and the West. First, Trump has surrounded himself by extremely right-wing pro-Israel advisers who want to bolster the colonial settlement enterprise, move the US embassy to Jerusalem, and undermine the Iran nuclear deal. This is why the replacement of the first African American president by a man endorsed by the Ku Klux Klan was received with such great fanfare in the corridors of Israeli power. Second, and most importantly, Trump may seem to be capricious, but there is a direct and very straight line connecting his racist and misogynist views to Israel's colonial project. And history has taught us that it is reckless to brush aside racist and demagogic leaders.